Supported by Visual Art South West, Exeter based writer & artist Gabrielle Hoad received writing bursary to review the 'Prospecting' Artists Symposium in Somerset. Images by London based artist Léonie Hampton. 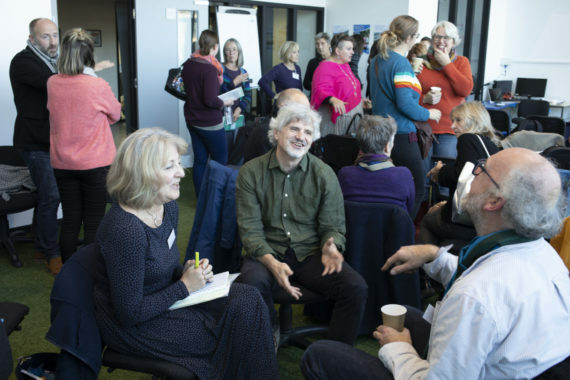 Making opportunities, not waiting for them to find you, was the over-riding theme of the Prospecting symposium organised by Somerset Art Works. The Chinese proverb, quoted by Susan Jones in her opening remarks, set the tone for a day that championed empowerment, collaboration and activism. 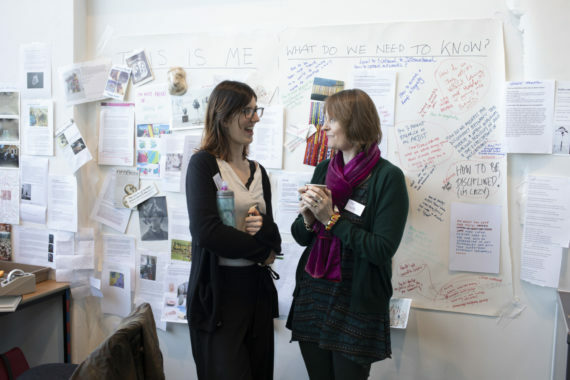 Starting from the premise that artists’ development activity should be driven by the individual needs of artists themselves, this highly interactive exercise in co-learning set out to provide ‘space for independent and collective reflection […] and exposing fresh ideas’. 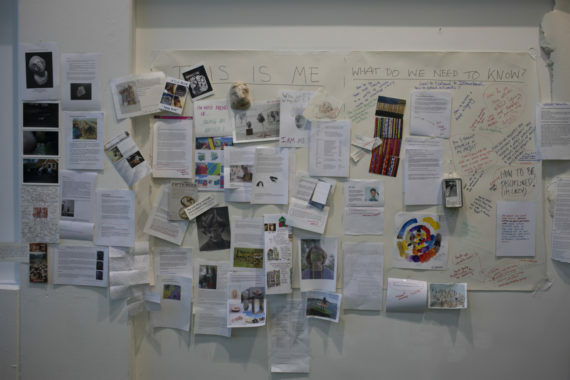 We began by pinning up pre-prepared images and text on the walls to introduce ourselves, and to raise issues and provocations in answer to the question: ‘What do we need to know?’. Then, with each artist paired with another they hadn’t met before, we set out to discuss ‘The things I must do to get to where I’d like to be in two years’ time’. The forty minutes allowed for this activity prompted relaxed, extended and often meaningful conversations. A series of workshops followed: Artists & Writing with Lara Eggleton, Artists & Galleries with Kerry Harker and Artists & Resilience with Lydia Catterall. 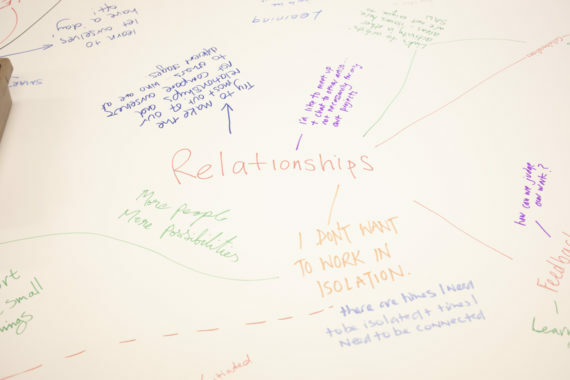 I attended Lydia’s workshop, a simple but very effective mind-mapping exercise that helped each of us recognise the connections we have, the skills and resources available to us, and the ways in which we might ‘top up our tanks’. 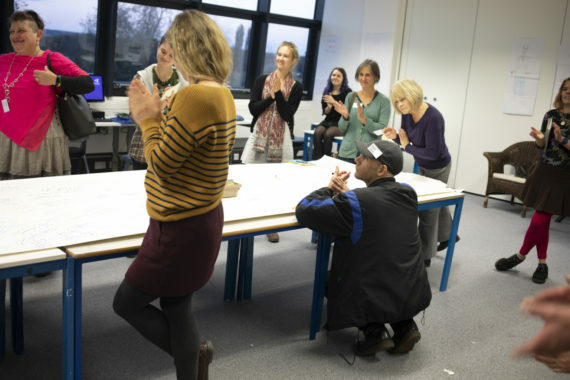 A fourth impromptu workshop on ‘Productive Relationships’ with Susan Jones was instigated in the afternoon in response to emerging questions around how Somerset Art Works might further connect and support artists through alliances with other disciplines and organisations. It also covered the way artists negotiate their own relationships with potential partners, funders, supporters, mentors and peers. During afternoon presentations by Rebecca Chesney, Anna Francis and Nicola Naismith, we were joined by a handful of invited ‘virtual participants’, linked into the event by our smartphones. Though subject to inevitable technological glitches, it was an exercise that reflected the event’s wider ethos of openness, connectedness and communication. Rebecca Chesney (also contributing remotely via skype) talked about building her practice from scratch through following personal interests and working across boundaries. (She has no formal art school training.) Anna Francis shared her experiences of working and living as part of a community in Stoke-on-Trent, where she’s made both large and small changes in public space to transform the way people use it. Nicola Naismith talked about the rewards of working on self-initiated projects rather than trying to bend one’s individual practice to the requirements of commissioners. But she emphasised the importance of ‘building networks and unlikely alliances’ to make them happen – as well as the need to adopt ‘the long view’ as such projects may take up to a decade to come to fruition. A darker theme began to emerge when Rebecca highlighted, from personal experience, the way that serious illness can overwhelm and isolate a self-employed artist. Anna and Nicola also offered a contrast to the morning’s optimism with their discussions of the pressing need to improve the working lives of artists. Anna drew attention to the value artist activists offer communities, and raised the issue of the personal cost of doing such work. 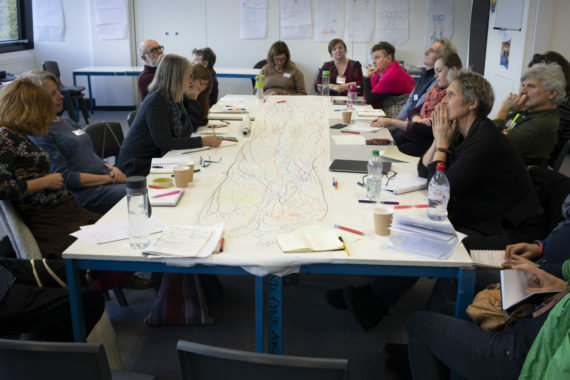 Drawing on her current AHRC-funded research, Nicola asked ‘Who supports the artists working in arts and health settings?’ and explored issues around the precariat and the gig economy. The goodwill and gifting that is such a positive feature of most artists’ practice also makes us susceptible to exploitation. The event and its lead-up were punctuated with a series of small tasks and questions, designed to prompt thought and reflection. 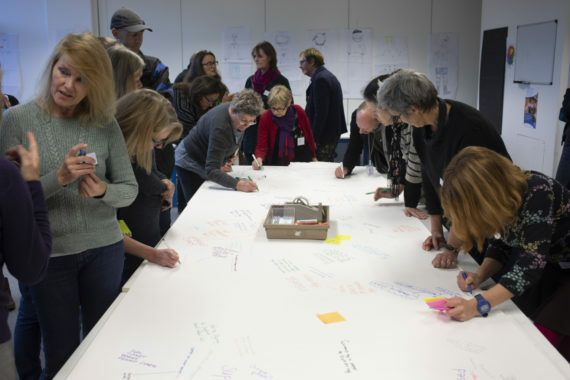 A final session offered the chance to collectively map ideas, suggestions and queries that might take Somerset Art Works forward and help it better meet the needs of member artists in the future. The five minutes of quiet reflection that preceded this activity acknowledged that not all artists can think on their feet and may need longer to prepare thoughtful contributions. In fact, a consistent feature of the event was time to mingle, talk and relax but also to be quiet and think. 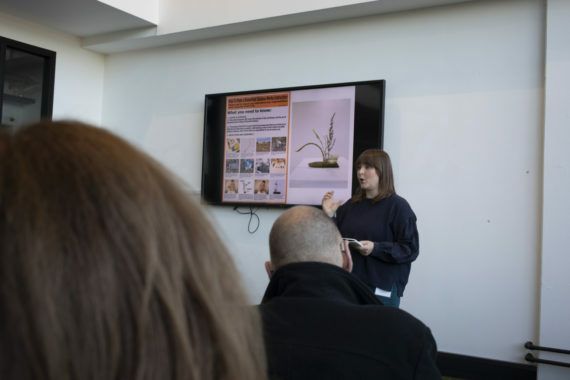 Inviting contributors with urban practices from the Midlands and North to guide artists working in a largely rural area of the South West carried a small risk for the organisers, as the issues artists face can be very different. However, the highly interactive and responsive nature of the workshops and discussions ensured this was not a problem for most participants. For me, the chance to connect and hear views from outside the South West was extremely welcome. I’d like to see much more cross-fertilisation between CVAN member regions at grassroots level. I also look forward to seeing what Somerset Art Works does with the rich set of learnings and ideas generated by this event. 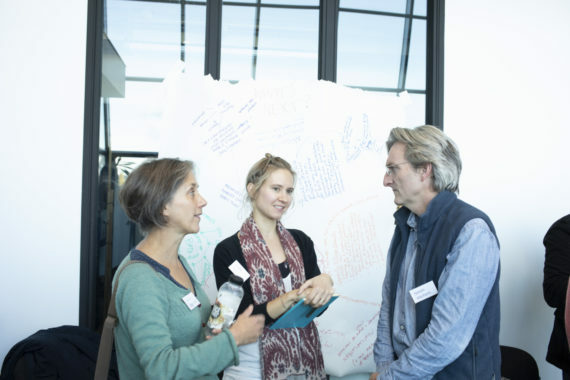 The Prospecting Symposium (1st November, University Centre Somerset) was developed through a collaboration between arts researcher Susan Jones and Anna Best, artist and initiator of Prospectus. Produced & organised by Somerset Art Works, working in partnership with Visual Arts South West and University Centre Somerset. Supported by Arts Council England.